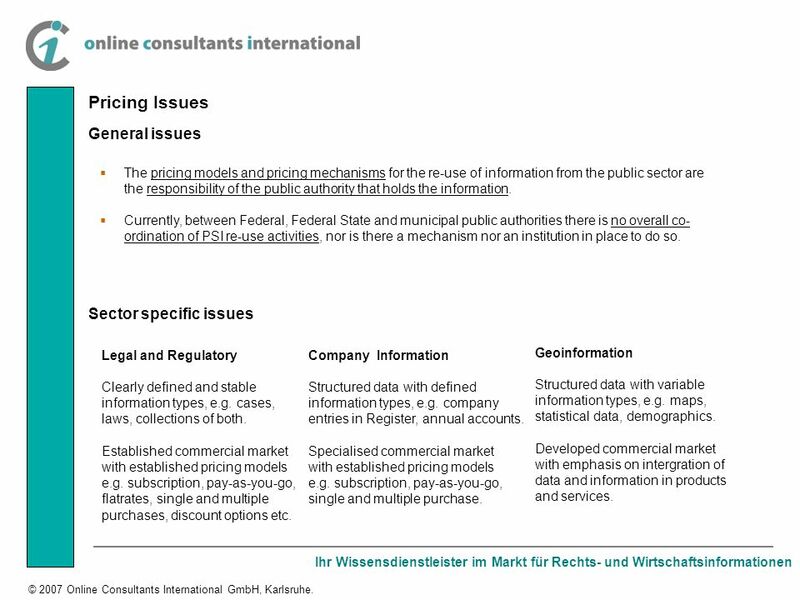 Ihr Wissensdienstleister im Markt für Rechts- und Wirtschaftsinformationen © 2007 Online Consultants International GmbH, Karlsruhe. ePSIplus Thematic Meeting. 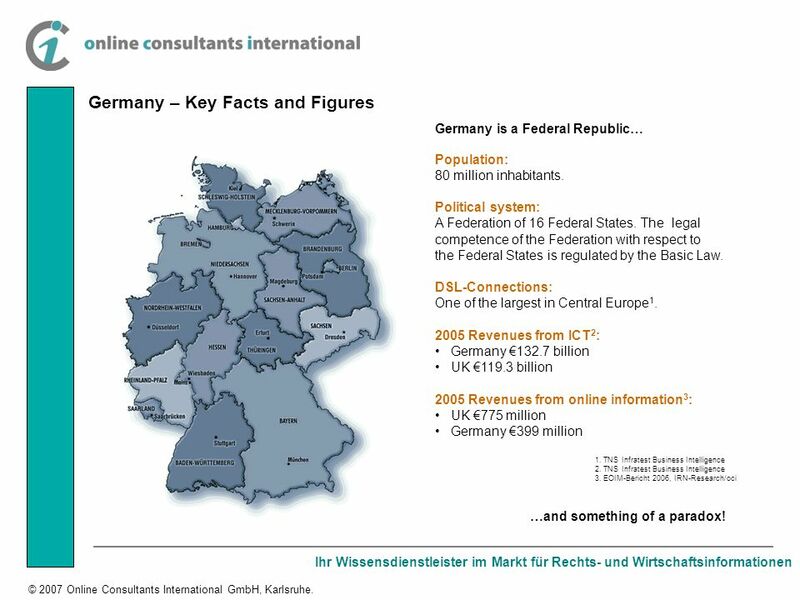 2 Ihr Wissensdienstleister im Markt für Rechts- und Wirtschaftsinformationen © 2007 Online Consultants International GmbH, Karlsruhe. 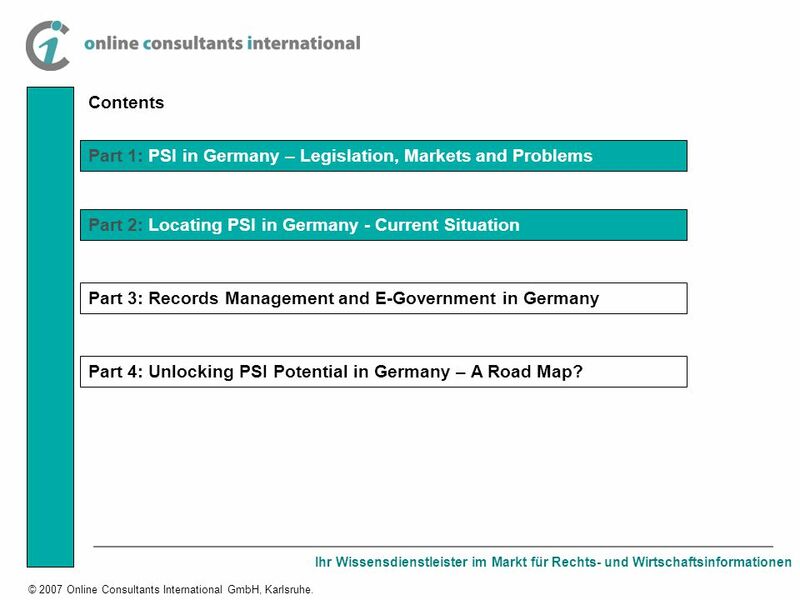 Contents Part 1: PSI in Germany – Legislation, Markets and Problems Part 2: Locating PSI in Germany - Current Situation Part 3: Records Management and E-Government in Germany Part 4: Unlocking PSI Potential in Germany – A Road Map? 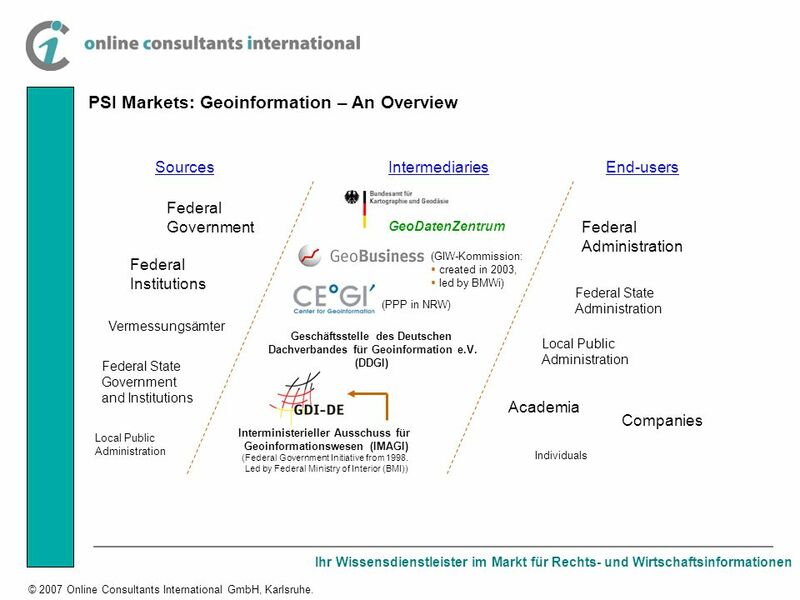 5 Ihr Wissensdienstleister im Markt für Rechts- und Wirtschaftsinformationen © 2007 Online Consultants International GmbH, Karlsruhe. 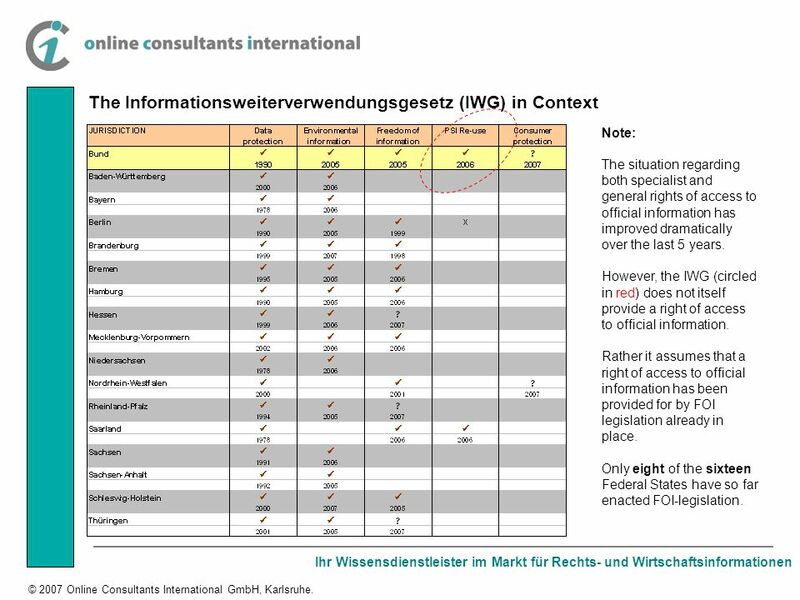 The Informationsweiterverwendungsgesetz (IWG) in Context Note: The situation regarding both specialist and general rights of access to official information has improved dramatically over the last 5 years. 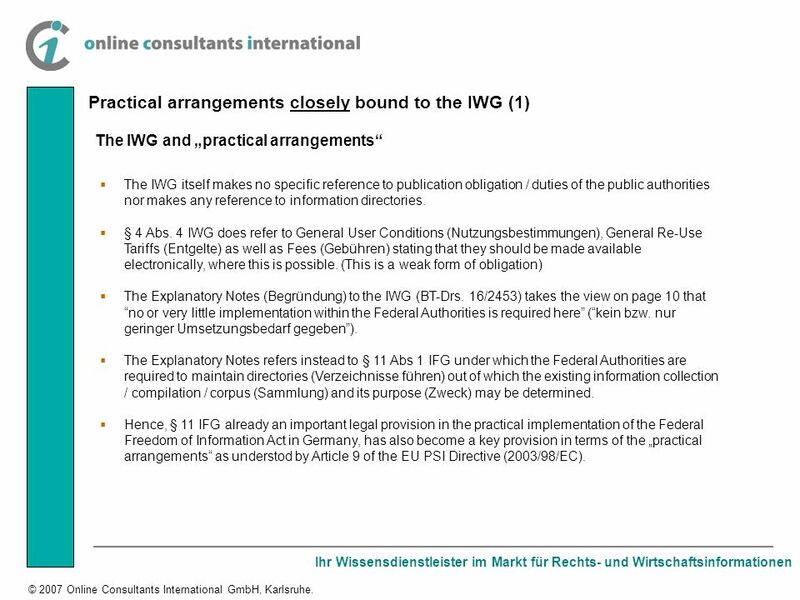 However, the IWG (circled in red) does not itself provide a right of access to official information. Rather it assumes that a right of access to official information has been provided for by FOI legislation already in place. Only eight of the sixteen Federal States have so far enacted FOI-legislation. 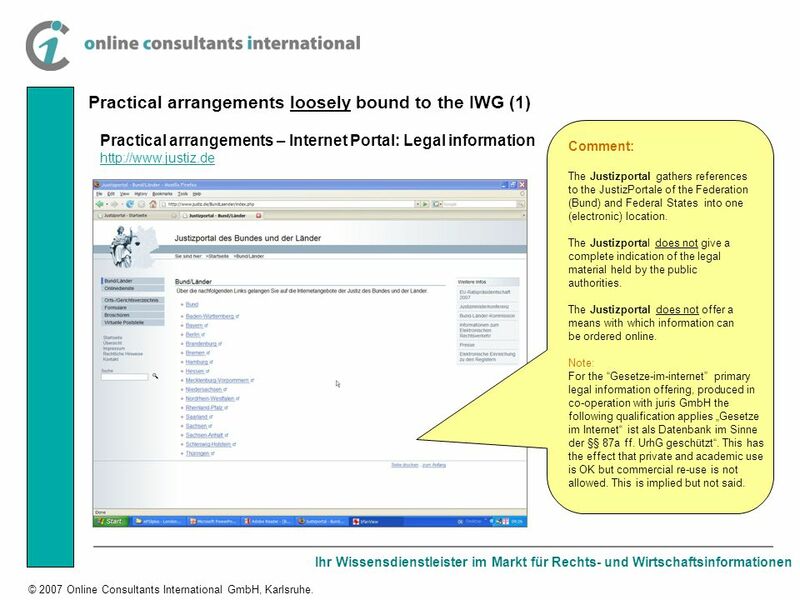 11 Ihr Wissensdienstleister im Markt für Rechts- und Wirtschaftsinformationen © 2007 Online Consultants International GmbH, Karlsruhe. 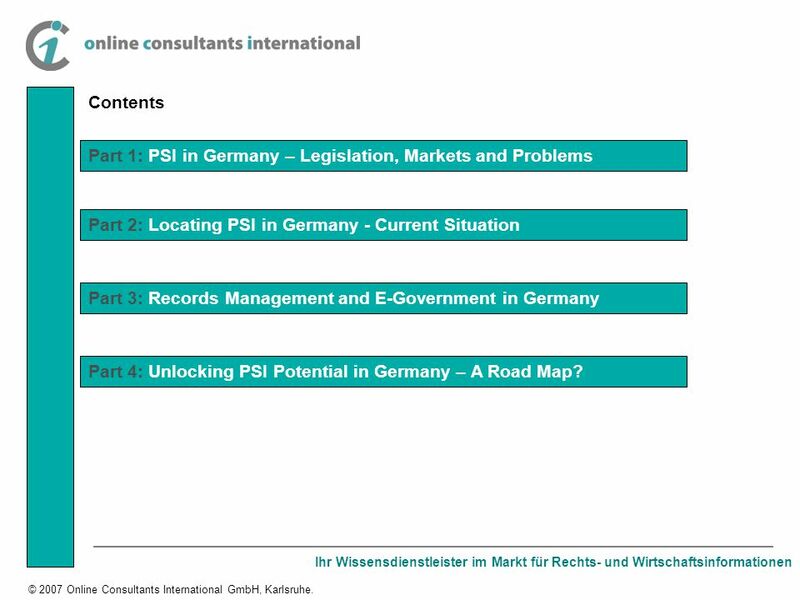 Contents Part 1: PSI in Germany – Legislation, Markets and Problems Part 2: Locating PSI in Germany - Current Situation Part 3: Records Management and E-Government in Germany Part 4: Unlocking PSI Potential in Germany – A Road Map? 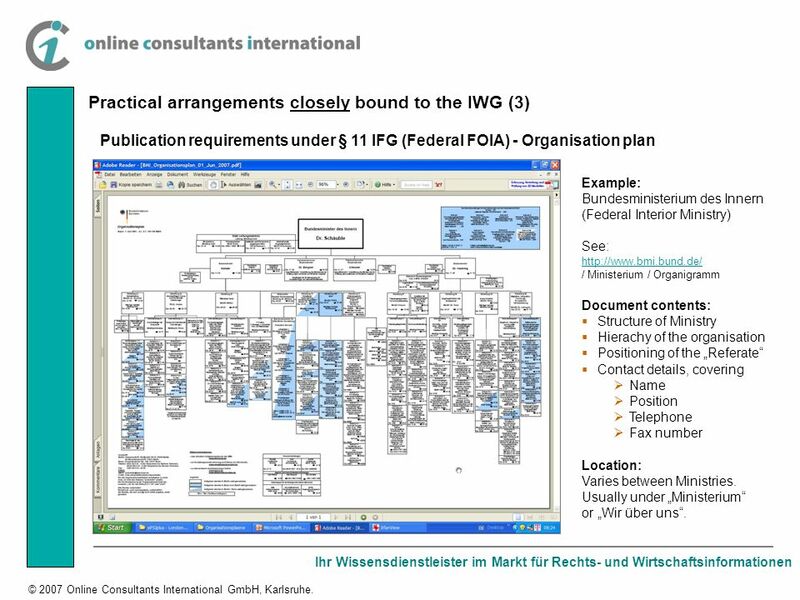 12 Ihr Wissensdienstleister im Markt für Rechts- und Wirtschaftsinformationen © 2007 Online Consultants International GmbH, Karlsruhe. 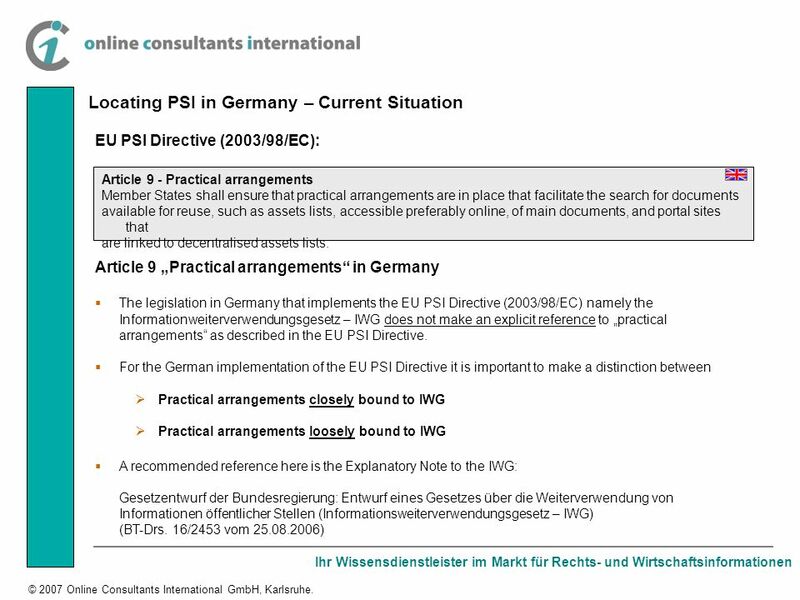 Locating PSI in Germany – Current Situation Article 9 Practical arrangements in Germany The legislation in Germany that implements the EU PSI Directive (2003/98/EC) namely the Informationweiterverwendungsgesetz – IWG does not make an explicit reference to practical arrangements as described in the EU PSI Directive. 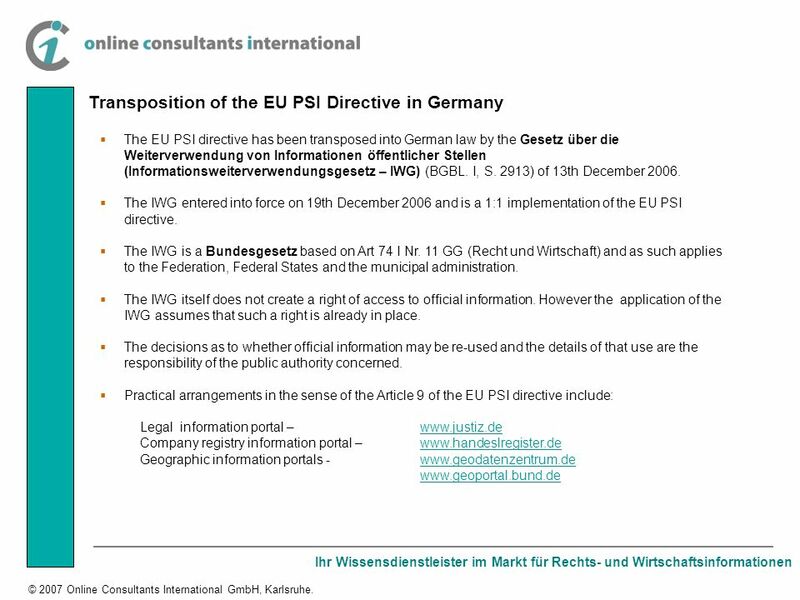 For the German implementation of the EU PSI Directive it is important to make a distinction between Practical arrangements closely bound to IWG Practical arrangements loosely bound to IWG A recommended reference here is the Explanatory Note to the IWG: Gesetzentwurf der Bundesregierung: Entwurf eines Gesetzes über die Weiterverwendung von Informationen öffentlicher Stellen (Informationsweiterverwendungsgesetz – IWG) (BT-Drs. 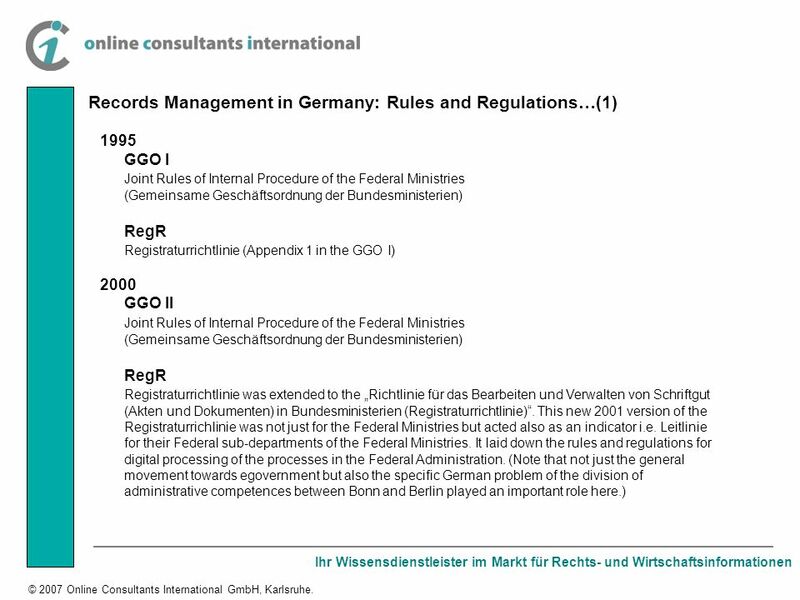 16/2453 vom 25.08.2006) EU PSI Directive (2003/98/EC): Article 9 - Practical arrangements Member States shall ensure that practical arrangements are in place that facilitate the search for documents available for reuse, such as assets lists, accessible preferably online, of main documents, and portal sites that are linked to decentralised assets lists. 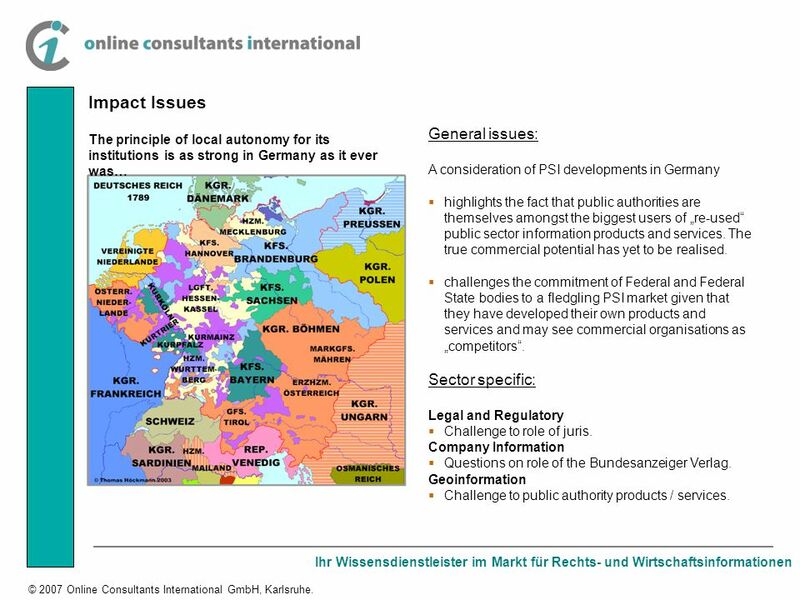 15 Ihr Wissensdienstleister im Markt für Rechts- und Wirtschaftsinformationen © 2007 Online Consultants International GmbH, Karlsruhe. 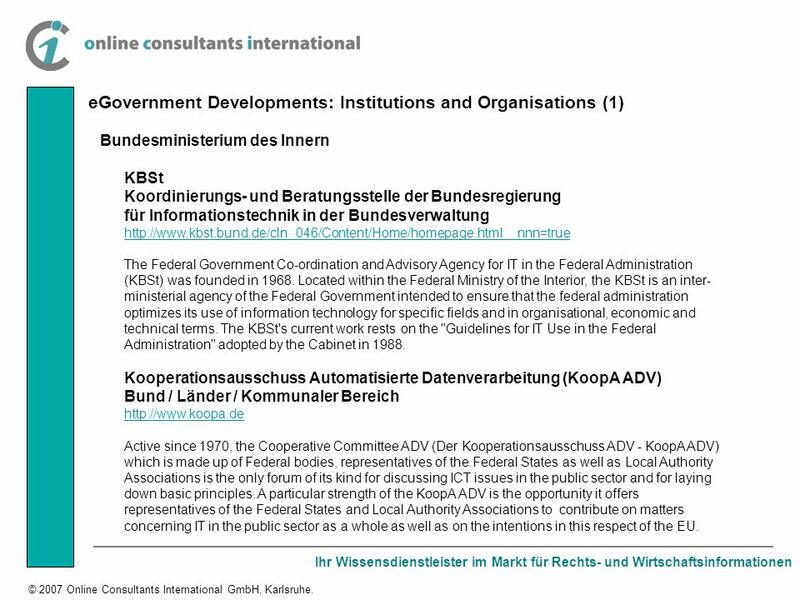 Publication requirements under § 11 IFG (Federal FOIA) - Organisation plan Practical arrangements closely bound to the IWG (3) Example: Bundesministerium des Innern (Federal Interior Ministry) See: http://www.bmi.bund.de/ / Ministerium / Organigramm Document contents: Structure of Ministry Hierachy of the organisation Positioning of the Referate Contact details, covering Name Position Telephone Fax number Location: Varies between Ministries. Usually under Ministerium or Wir über uns. 16 Ihr Wissensdienstleister im Markt für Rechts- und Wirtschaftsinformationen © 2007 Online Consultants International GmbH, Karlsruhe. 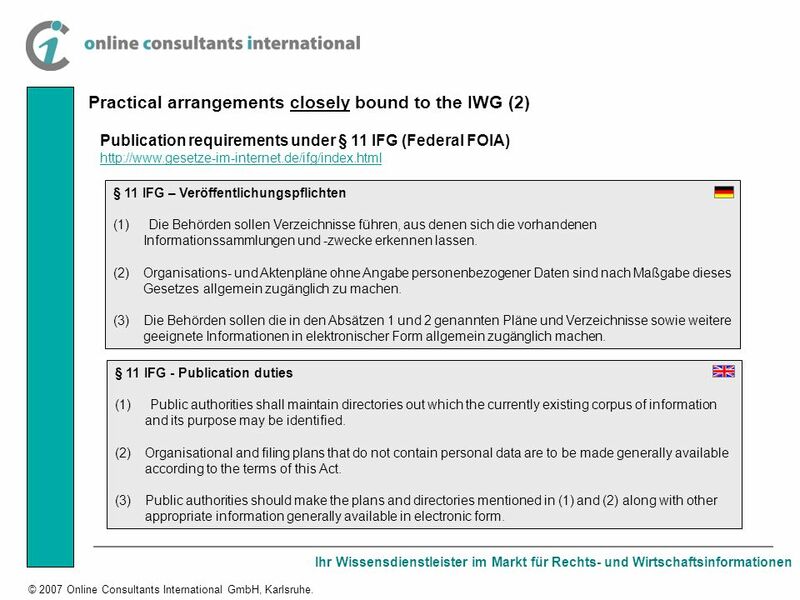 Publication requirements under § 11 IFG (Federal FOIA) – Filing plan Practical arrangements closely bound to the IWG (4) Example: Bundesministerium des Innern (Federal Interior Ministry) See: http://www.bmi.bund.de/ / Themen A-Z / Verfassungs- und Verwaltungsrecht / Informationsfreiheitsgesetz / Document contents: Subject classification Classification into groups Subject numbering system File reference systems Location: Varies between Ministries. 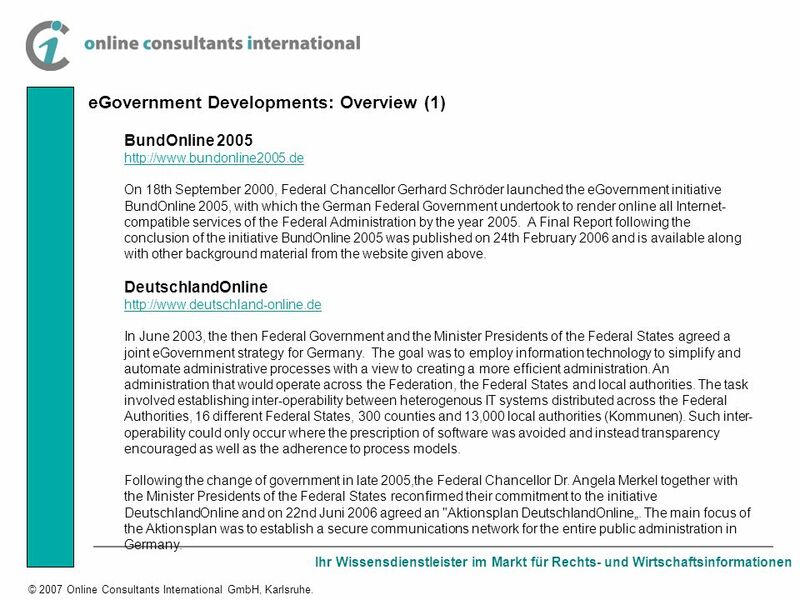 20 Ihr Wissensdienstleister im Markt für Rechts- und Wirtschaftsinformationen © 2007 Online Consultants International GmbH, Karlsruhe. 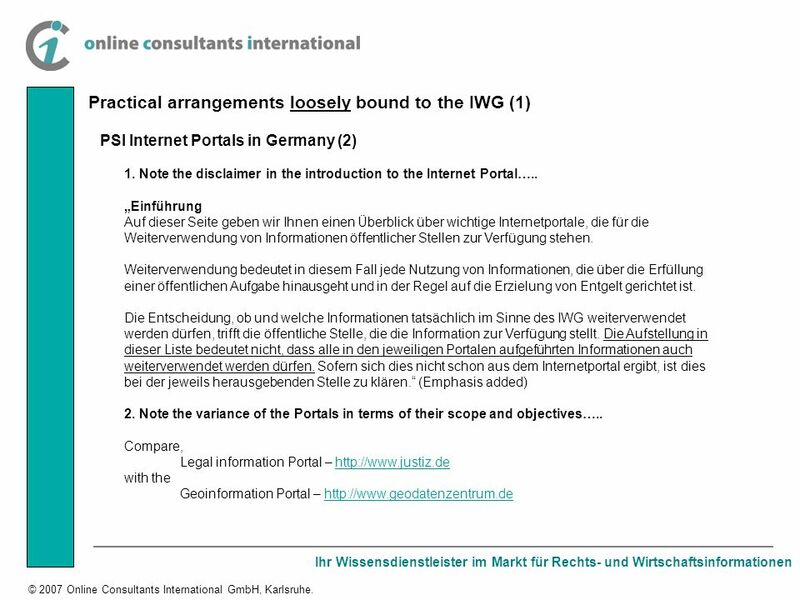 Practical arrangements – Internet Portal: Geoinformation http://www.geodatenzentrum.de Practical arrangements loosely bound to the IWG (2) Comment: Produced by the Federal Office for Cartography and Geodesy (Bundesamt für Kartographie und Geodäsie - BKG) The GeoDatenZentrum portal is a cooperative venture between the Federation and the 16 Federal States. (See BT-Drs. 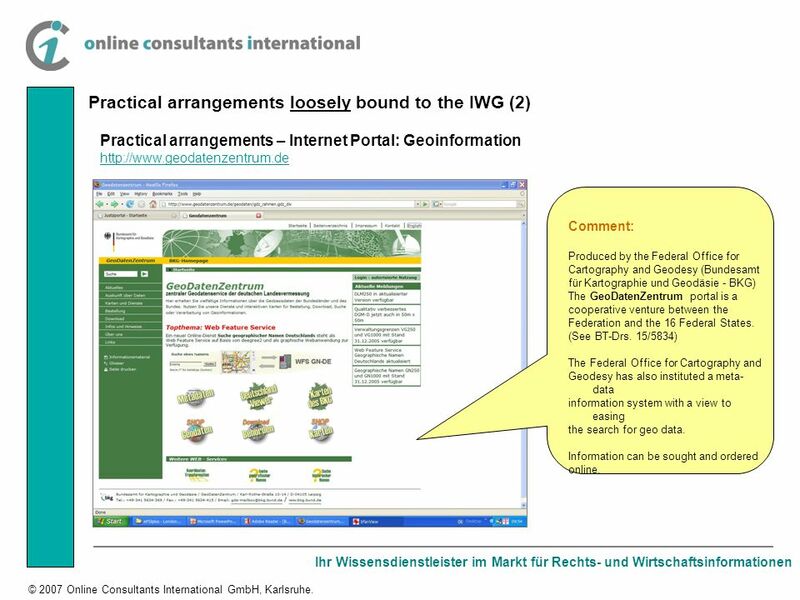 15/5834) The Federal Office for Cartography and Geodesy has also instituted a meta- data information system with a view to easing the search for geo data. Information can be sought and ordered online. 21 Ihr Wissensdienstleister im Markt für Rechts- und Wirtschaftsinformationen © 2007 Online Consultants International GmbH, Karlsruhe. 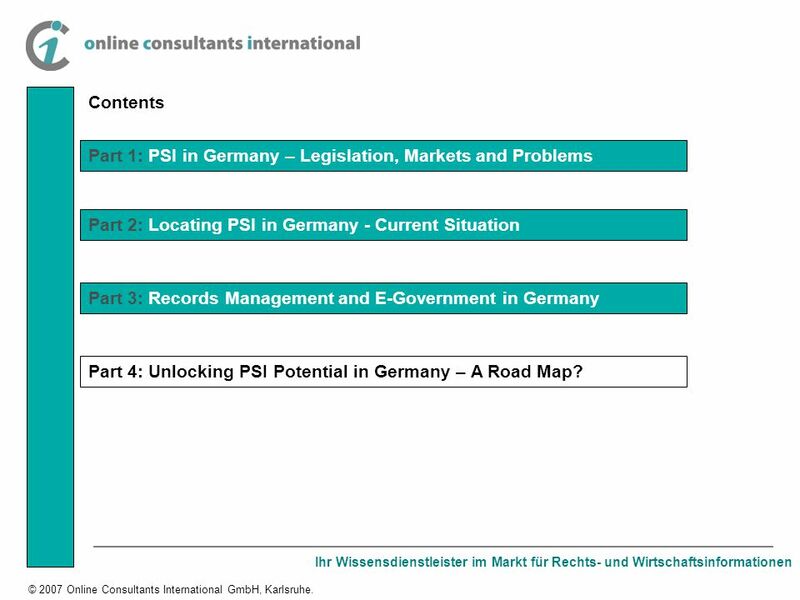 Contents Part 1: PSI in Germany – Legislation, Markets and Problems Part 2: Locating PSI in Germany - Current Situation Part 3: Records Management and E-Government in Germany Part 4: Unlocking PSI Potential in Germany – A Road Map? 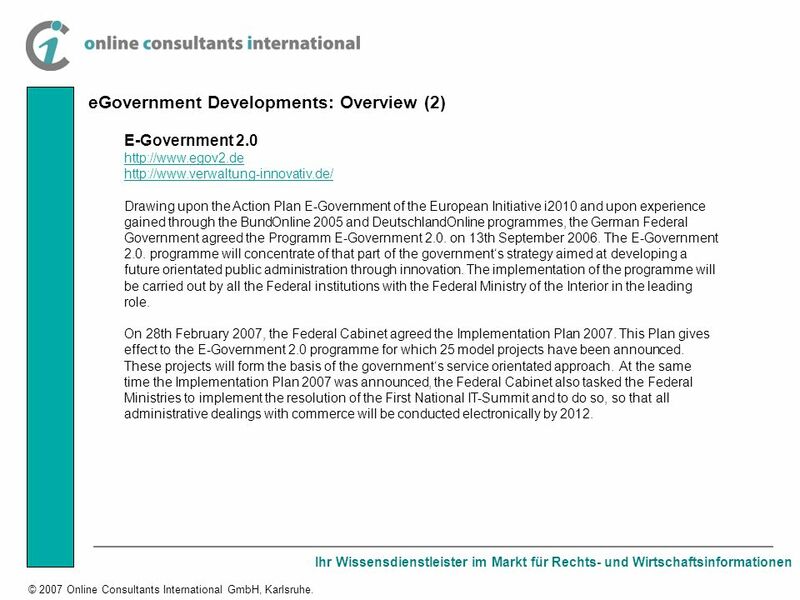 22 Ihr Wissensdienstleister im Markt für Rechts- und Wirtschaftsinformationen © 2007 Online Consultants International GmbH, Karlsruhe. 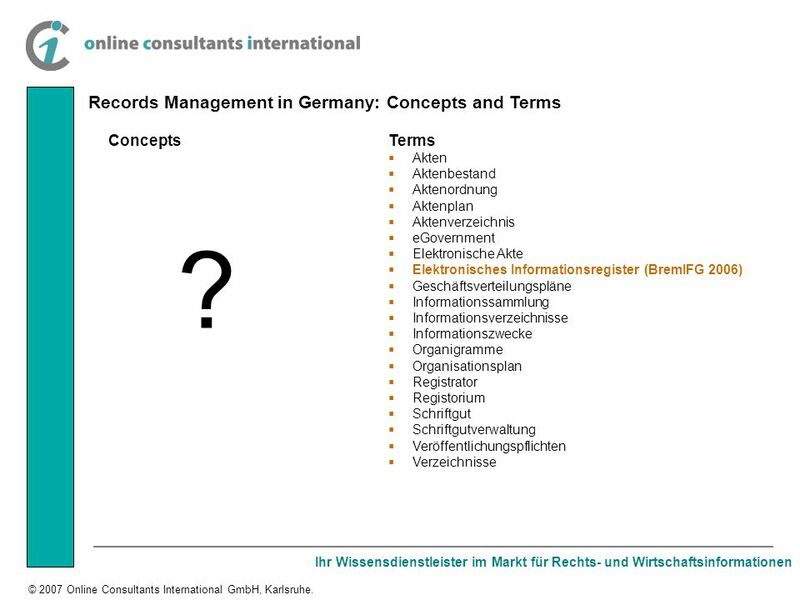 Records Management in Germany: Concepts and Terms Terms Akten Aktenbestand Aktenordnung Aktenplan Aktenverzeichnis eGovernment Elektronische Akte Elektronisches Informationsregister (BremIFG 2006) Geschäftsverteilungspläne Informationssammlung Informationsverzeichnisse Informationszwecke Organigramme Organisationsplan Registrator Registorium Schriftgut Schriftgutverwaltung Veröffentlichungspflichten Verzeichnisse Concepts ? 26 Ihr Wissensdienstleister im Markt für Rechts- und Wirtschaftsinformationen © 2007 Online Consultants International GmbH, Karlsruhe. 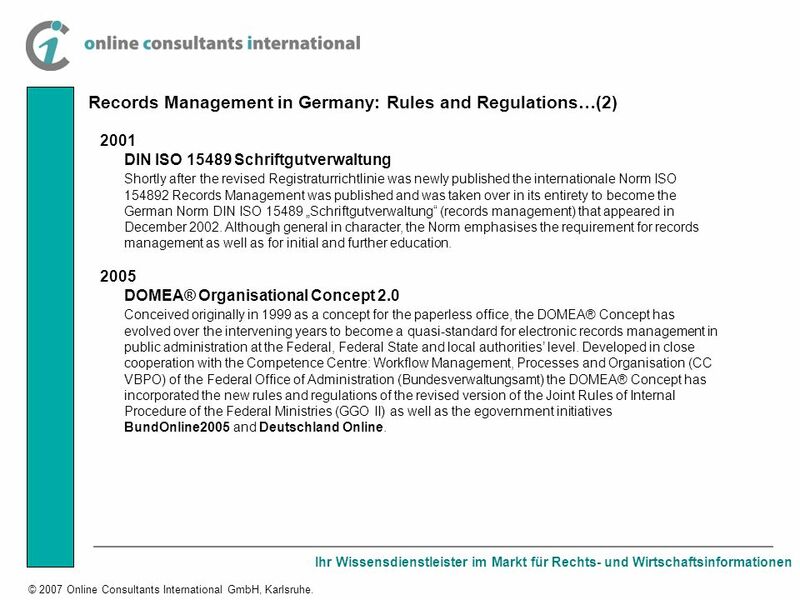 Records Management in Germany: Rules and Regulations…(2) 2001 DIN ISO 15489 Schriftgutverwaltung Shortly after the revised Registraturrichtlinie was newly published the internationale Norm ISO 154892 Records Management was published and was taken over in its entirety to become the German Norm DIN ISO 15489 Schriftgutverwaltung (records management) that appeared in December 2002. 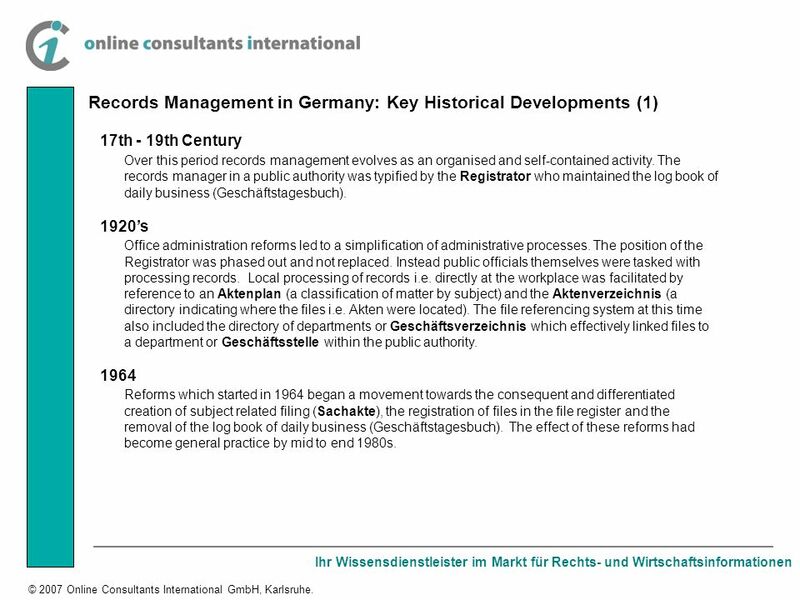 Although general in character, the Norm emphasises the requirement for records management as well as for initial and further education. 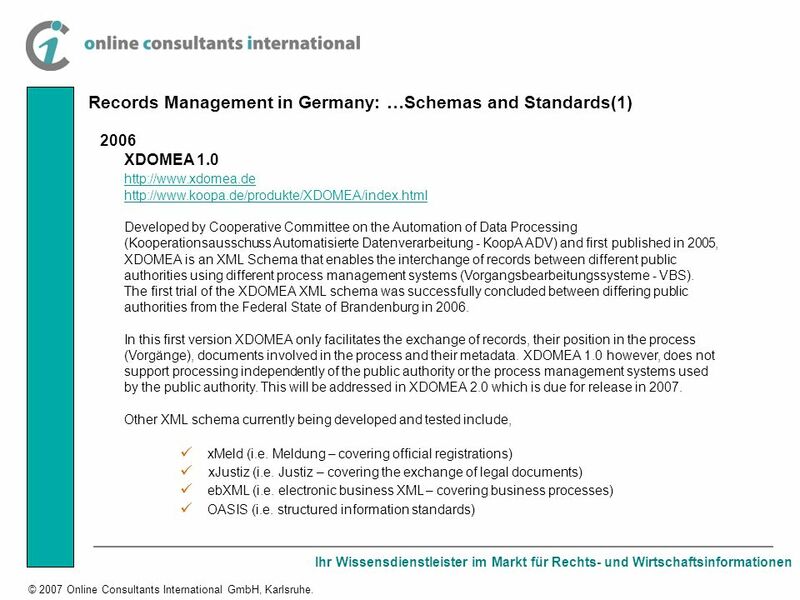 2005 DOMEA® Organisational Concept 2.0 Conceived originally in 1999 as a concept for the paperless office, the DOMEA® Concept has evolved over the intervening years to become a quasi-standard for electronic records management in public administration at the Federal, Federal State and local authorities level. 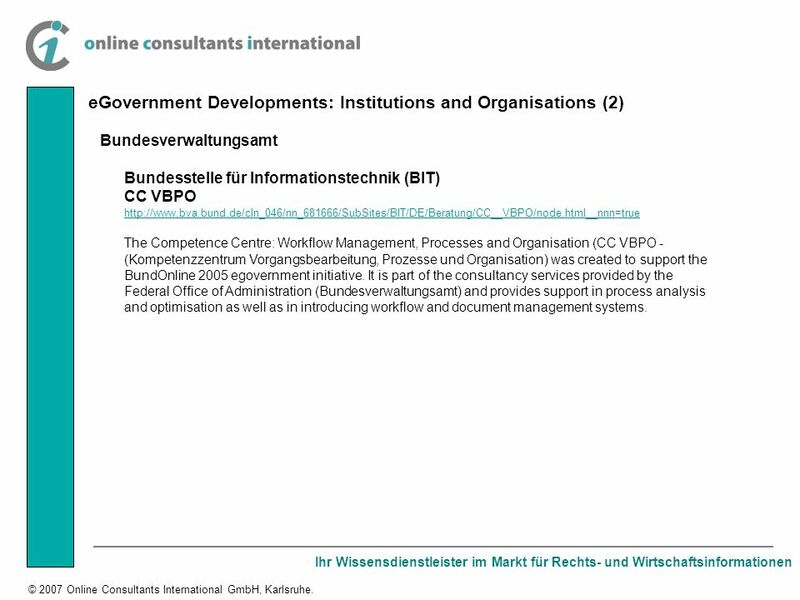 Developed in close cooperation with the Competence Centre: Workflow Management, Processes and Organisation (CC VBPO) of the Federal Office of Administration (Bundesverwaltungsamt) the DOMEA® Concept has incorporated the new rules and regulations of the revised version of the Joint Rules of Internal Procedure of the Federal Ministries (GGO II) as well as the egovernment initiatives BundOnline2005 and Deutschland Online. 28 Ihr Wissensdienstleister im Markt für Rechts- und Wirtschaftsinformationen © 2007 Online Consultants International GmbH, Karlsruhe. 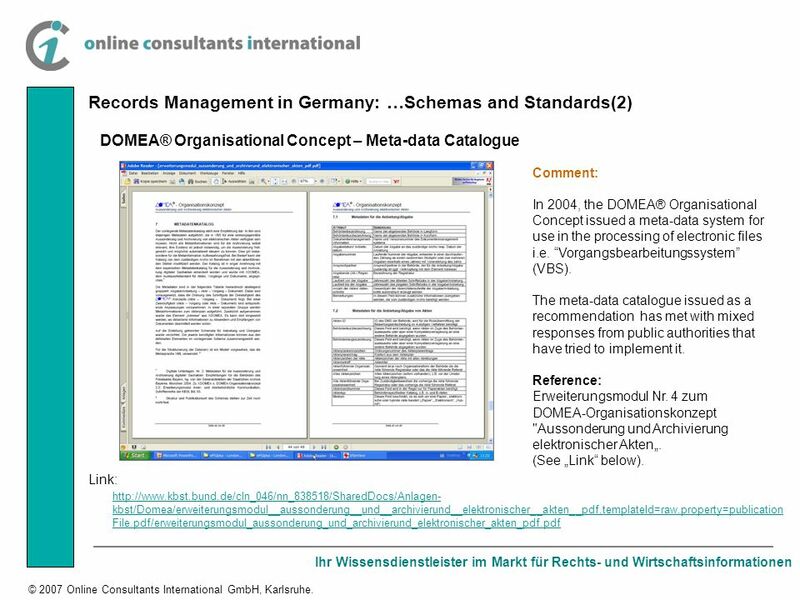 DOMEA® Organisational Concept – Meta-data Catalogue Records Management in Germany: …Schemas and Standards(2) Link: http://www.kbst.bund.de/cln_046/nn_838518/SharedDocs/Anlagen- kbst/Domea/erweiterungsmodul__aussonderung__und__archivierund__elektronischer__akten__pdf,templateId=raw,property=publication File.pdf/erweiterungsmodul_aussonderung_und_archivierund_elektronischer_akten_pdf.pdf Comment: In 2004, the DOMEA® Organisational Concept issued a meta-data system for use in the processing of electronic files i.e. Vorgangsbearbeitungssystem (VBS). The meta-data catalogue issued as a recommendation has met with mixed responses from public authorities that have tried to implement it. Reference: Erweiterungsmodul Nr. 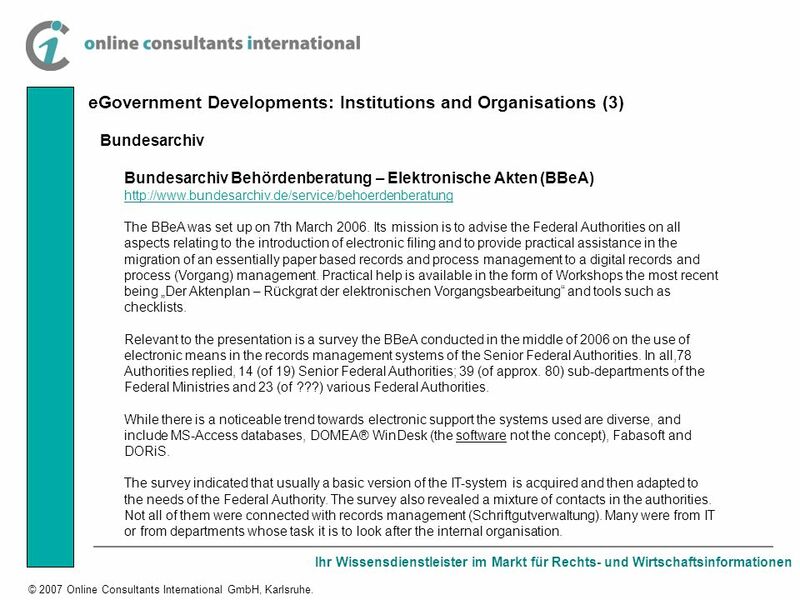 4 zum DOMEA-Organisationskonzept "Aussonderung und Archivierung elektronischer Akten. (See Link below). 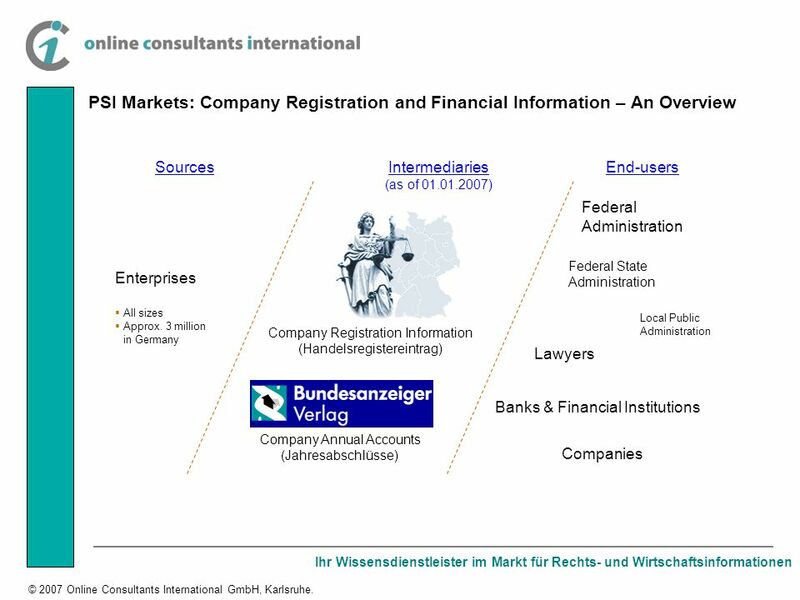 34 Ihr Wissensdienstleister im Markt für Rechts- und Wirtschaftsinformationen © 2007 Online Consultants International GmbH, Karlsruhe. 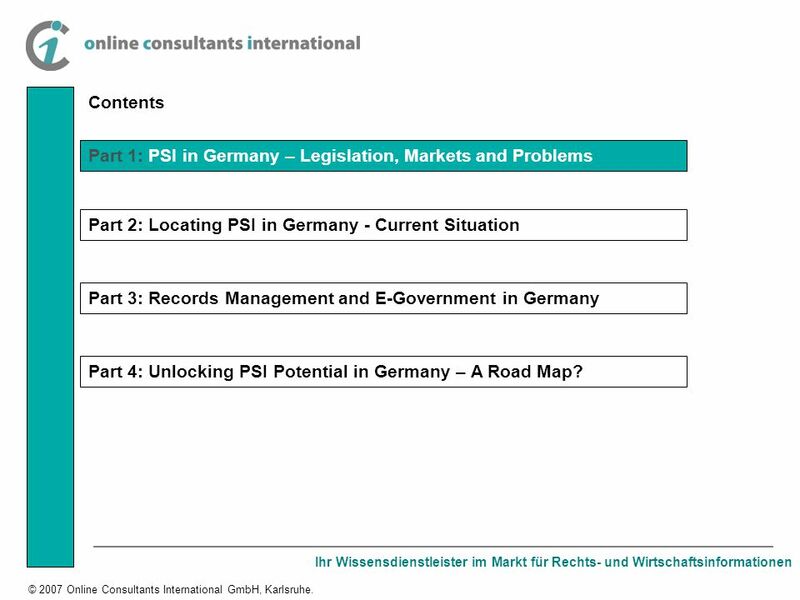 Contents Part 1: PSI in Germany – Legislation, Markets and Problems Part 2: Locating PSI in Germany - Current Situation Part 3: Records Management and E-Government in Germany Part 4: Unlocking PSI Potential in Germany – A Road Map? 35 Ihr Wissensdienstleister im Markt für Rechts- und Wirtschaftsinformationen © 2007 Online Consultants International GmbH, Karlsruhe. 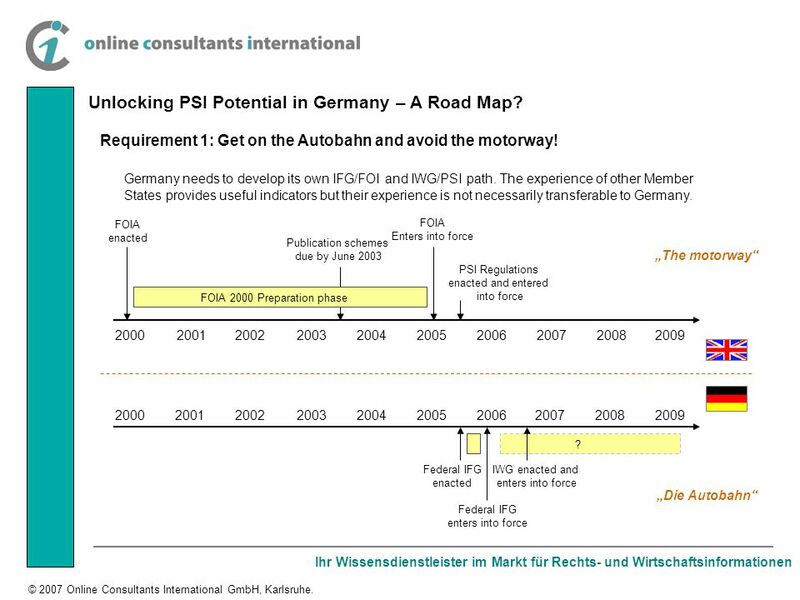 Unlocking PSI Potential in Germany – A Road Map? Requirement 1: Get on the Autobahn and avoid the motorway! 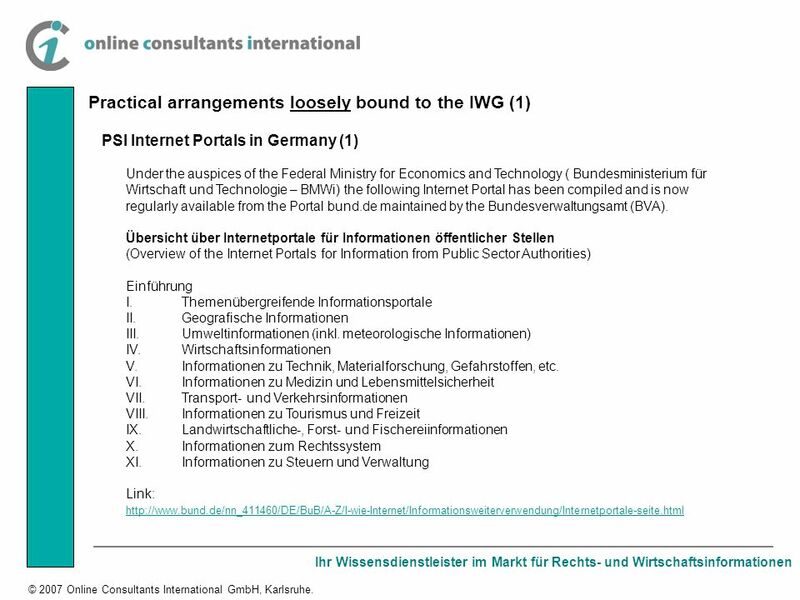 Germany needs to develop its own IFG/FOI and IWG/PSI path. The experience of other Member States provides useful indicators but their experience is not necessarily transferable to Germany. 2000200920082006200420032002200120052007 2000200120022003200420052006200720082009 Federal IFG enters into force IWG enacted and enters into force Federal IFG enacted FOIA enacted FOIA Enters into force Publication schemes due by June 2003 FOIA 2000 Preparation phase PSI Regulations enacted and entered into force Die Autobahn The motorway ? 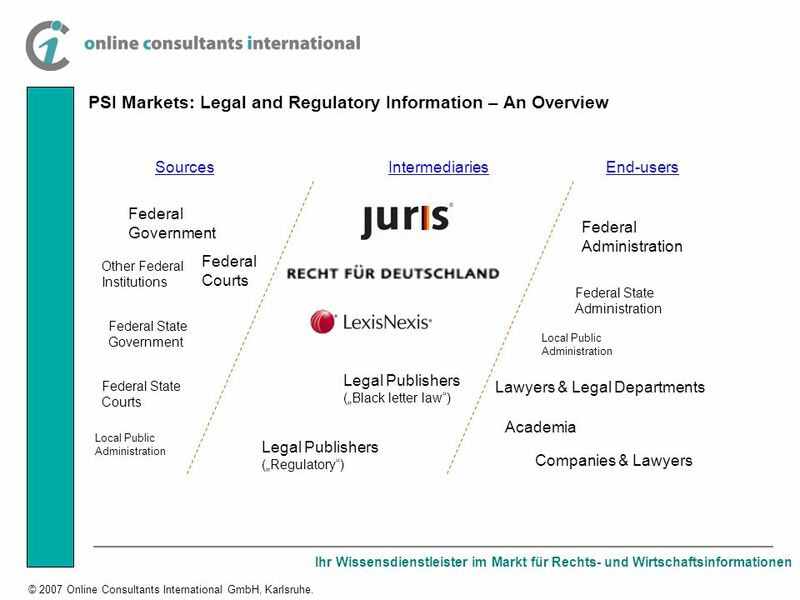 36 Ihr Wissensdienstleister im Markt für Rechts- und Wirtschaftsinformationen © 2007 Online Consultants International GmbH, Karlsruhe. 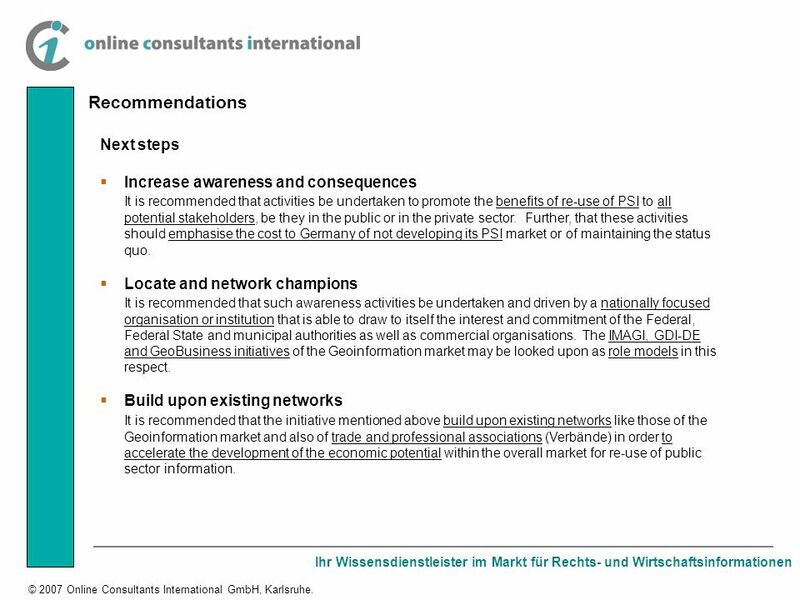 Unlocking PSI Potential in Germany – A Road Map? Requirement 2: Get a map or better still make one! 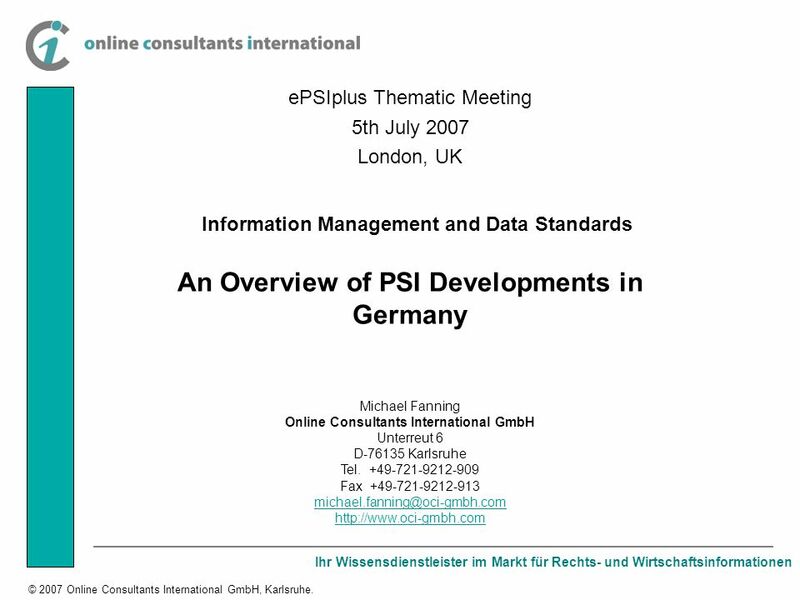 There are a lot of actual or potential PSI stakeholders in Germany. They need to be identified, their concerns, requirements and wishes articulated and given a common forum for further development. 37 Ihr Wissensdienstleister im Markt für Rechts- und Wirtschaftsinformationen © 2007 Online Consultants International GmbH, Karlsruhe. 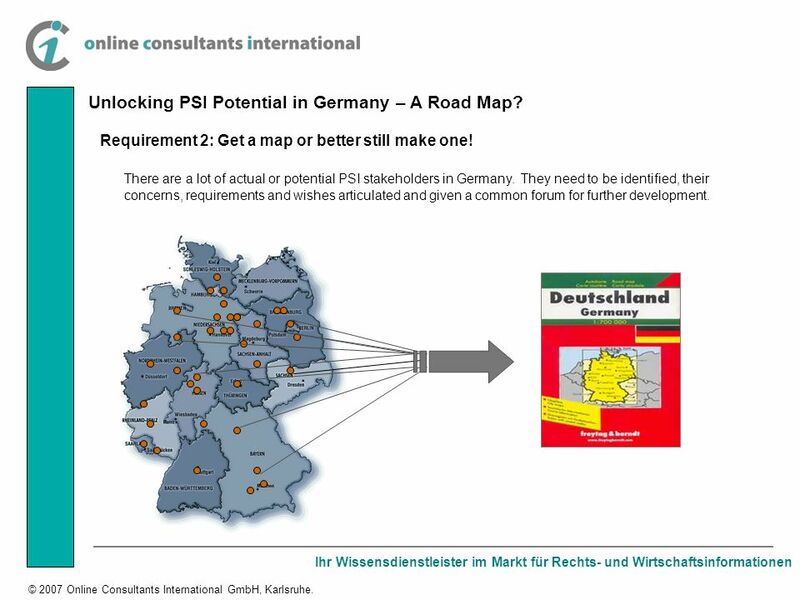 Unlocking PSI Potential in Germany – A Road Map? Requirement 3: Get a direction, preferably a strategic direction! 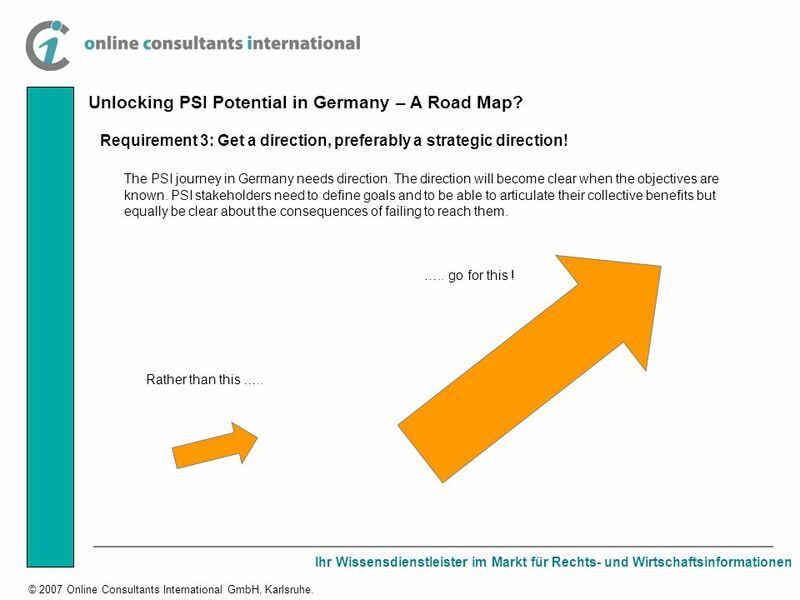 The PSI journey in Germany needs direction. The direction will become clear when the objectives are known. PSI stakeholders need to define goals and to be able to articulate their collective benefits but equally be clear about the consequences of failing to reach them. Rather than this ….. ….. go for this ! 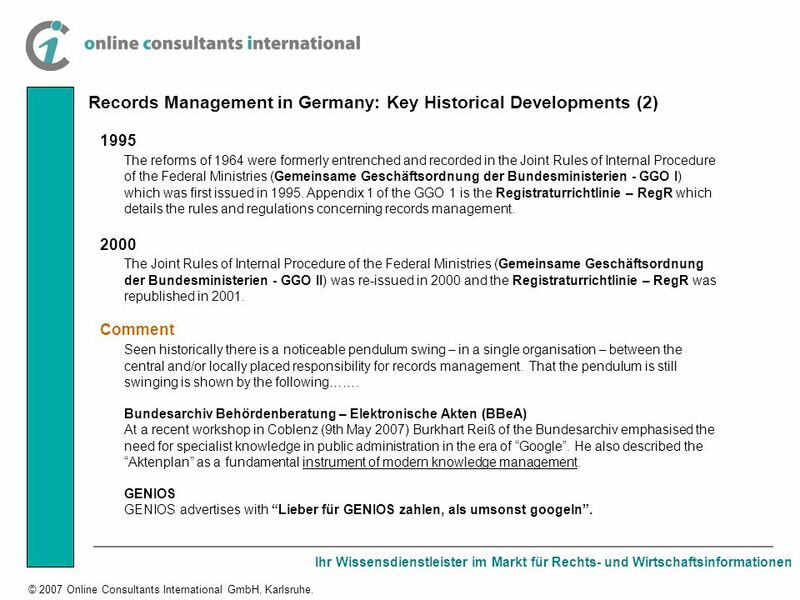 Herunterladen ppt "Ihr Wissensdienstleister im Markt für Rechts- und Wirtschaftsinformationen © 2007 Online Consultants International GmbH, Karlsruhe. ePSIplus Thematic Meeting." Environmental Assessment in Germany Environmental Assessment in Federations: Current Dynamics and Emerging Issues September , 2009 Ottawa, Canada. The difference between kein and nicht. 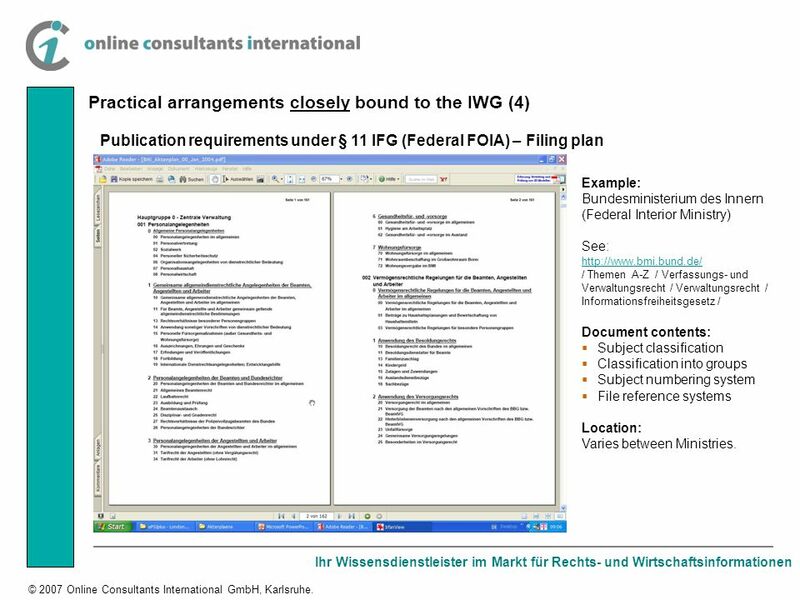 International Developments in Accounting and Auditing - Challenges for the Profession - Georg Lanfermann Partner Department of Professional Practice Audit. INSURANCE AUDIT FINANCIAL SERVICES Risk margins: An area of conflict between accounting and supervision Joachim Kölschbach Vienna, October 2005. Einführung Bild und Erkenntnis Einige Probleme Fazit Eberhard Karls Universität Tübingen Philosophische Fakultät Institut für Medienwissenschaft Epistemic.